Sometimes you get the best ideas when you have insomnia. 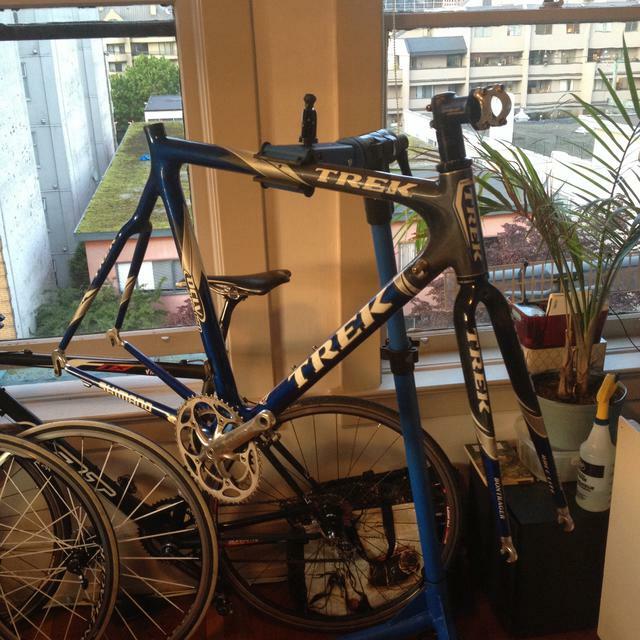 Inspired by a build on Weight Weenies, I was browsing eBay last night for old lugged carbon frames and came across a complete 2004 Trek 5200 for sale in my neighborhood. Seeing bikes in person and avoiding cross-border shipping is always good, I haven't had the greatest experiences with Canada Post lately. I wasn't really planning on buying another bike so soon after my Felt F1X purchase, but since it was so close, I figured I might as well have a look. Turns out the frame was the right size for me (56 cm), condition was as expected (pretty rough), so after a bit of negotiating we agreed on a price we could both be happy with. Purely by coincidence it was the same guy that I bought my Trek 1200 road bike from last year; I took it as a good omen. I love projects and this is going to be a good one. The plan is to completely strip the bike down to bare carbon, sell off any parts that are worth selling, and build it up from scratch. 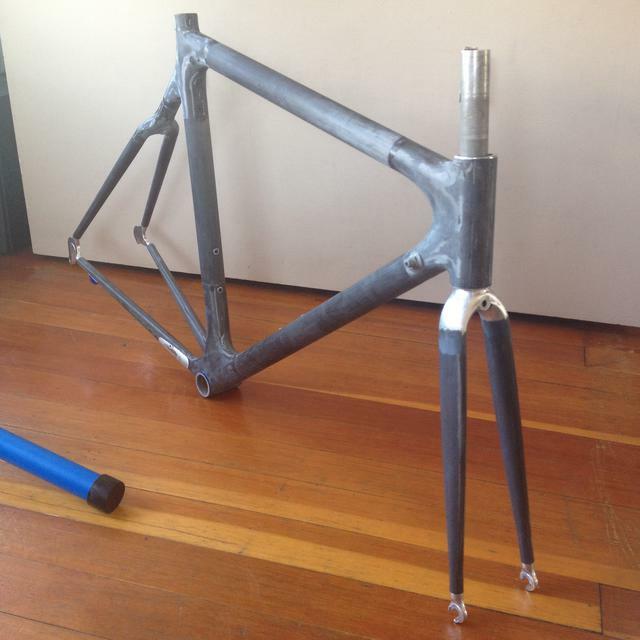 From what I've read, the carbon layup can vary greatly from bike to bike, so I'll see what's under the paint. If it's ugly I'll shoot it black instead of clear - at least that will mean less prep work. 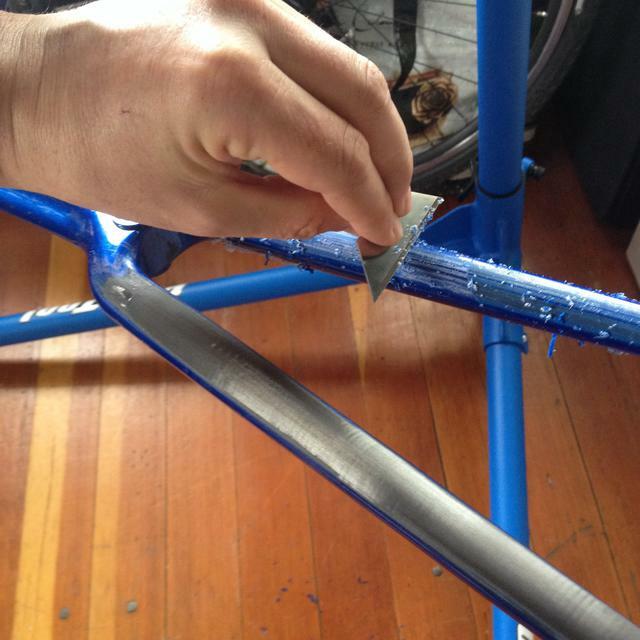 I'm going to use the razor blade & scotch brite & wet sanding method, I don't trust paint stripping chemicals on a carbon frame bike. Plus I live in an apartment and stripping chemicals are very hazardous and smelly. It's going to be a lot of work but the end result will be a one of a kind with every part selected deliberately. 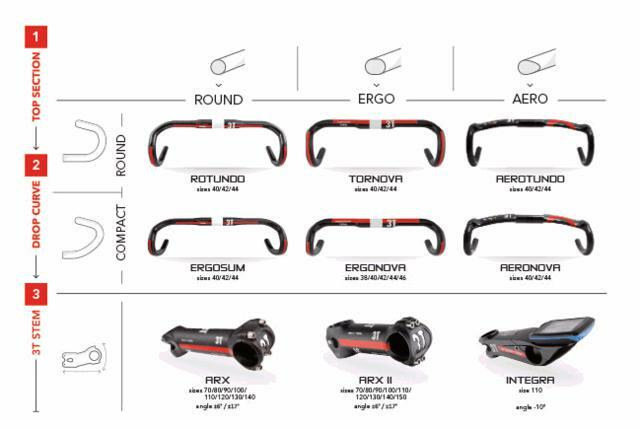 From what I've researched, it shouldn't be too hard to get it near the UCI weight limit for a very reasonable amount of money. Plus, I just really like wrenching on my bikes. So, here's the starting point for this build thread. I'll post updates, photos, weights, and budget as the project progresses. 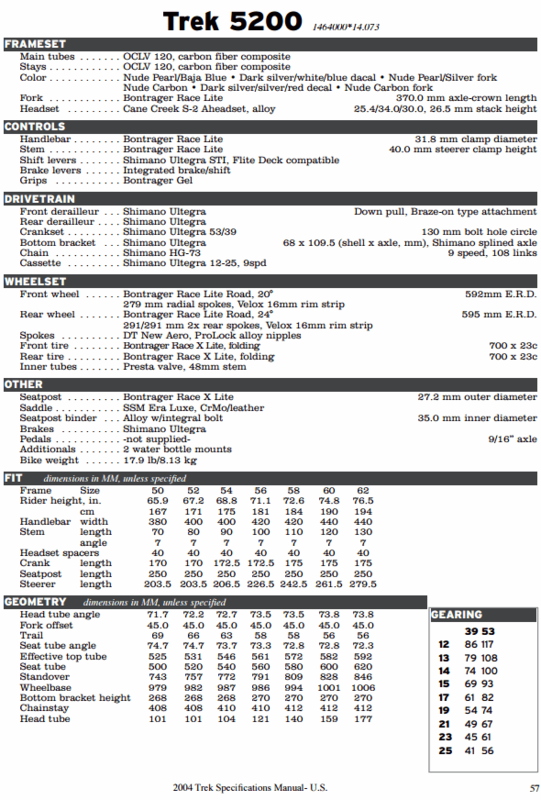 Found the spec sheet at Vintage Trek which should be useful. 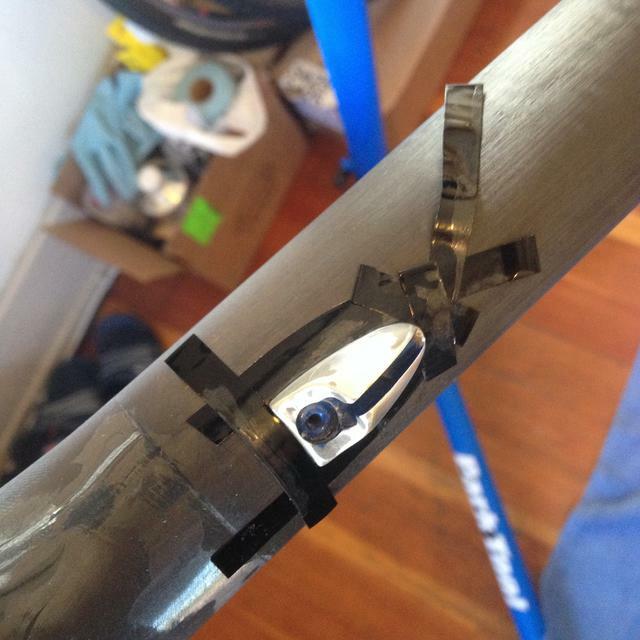 I figured the head tube angle was probably 73 degrees but it never hurts to double check these things. Hard to measure on the bike. 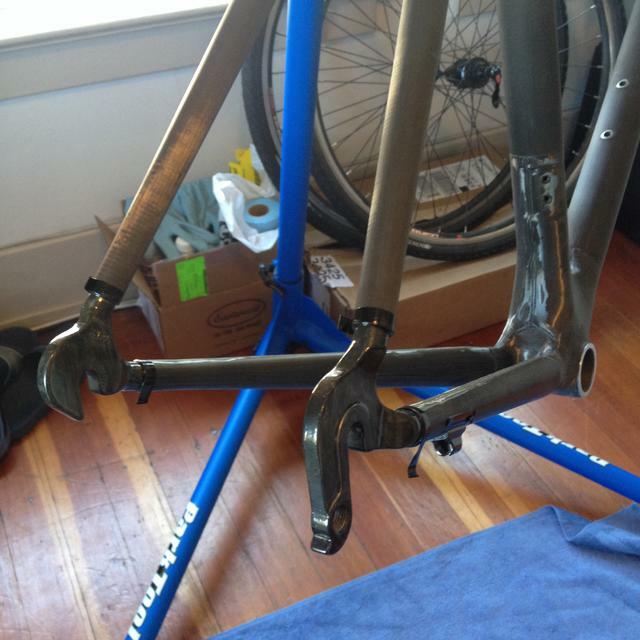 Took a break from doing taxes and stripped it down to frame and forks today. Got the cranks off fine, but the Octalink/ISIS BB collar is stuck. Going to soak it in PB Blaster overnight and try again. If I have time I'll take it to the shop tomorrow to have the threadless headset cups drifted out and the lower race removed from the fork. New headset and used groupset are in the mail already. They really went nuts with the decals on this thing. 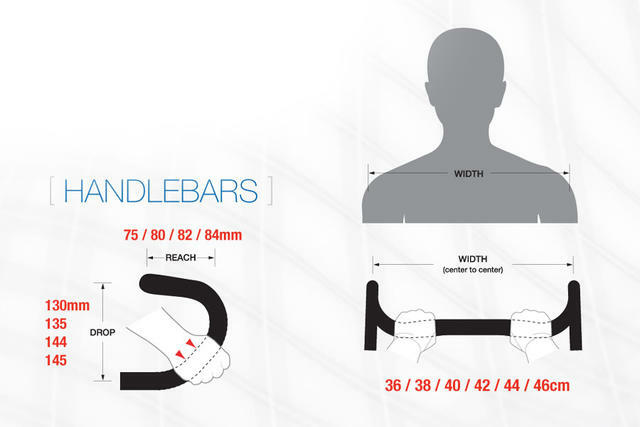 Picking new handlebars, measuring the semi-compact bars I'm currently using (and like) for comparison. Got the Octalink BB out easily after soaking it overnight in PB Blaster. Took the frame to the shop to have the threadless headset cups and fork lower race drifted off yesterday. Peeled 15 grams of decals off the frame and fork today. Would have gone faster with a heat gun, but mine is in storage somewhere so I just used a hair dryer. Heated up a small section at a time with the dryer on max for 60 seconds and worked my way down the tubes. Most of the decals came off in once piece, but there were a lot to do. 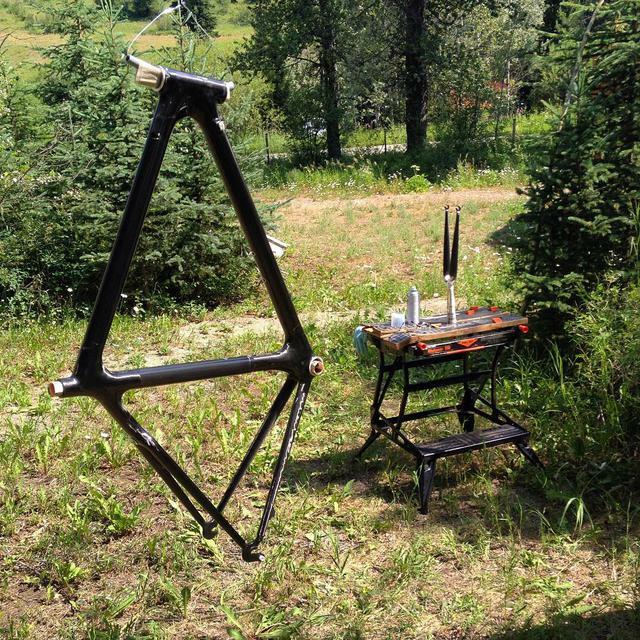 Wiped frame and fork down with a rag and a little lighter fluid to remove any remaining glue residue and grime. Took about 2 hours. The paint is sure sparkly. I guess they were into painting bikes like bowling balls in 2004. Started scraping off the paint using the razor method today. It's slow going, but I'm watching the Giro at the same time. You can apply a lot of pressure on the scraper, when you get through the paint to the carbon it's very easy to feel the difference (the carbon is a lot harder than the paint). Then use a wet Scotch Brite pad to get rid of any paint that's left. This is going to take a few days for sure. My Park Tool PCS-10 stand is very useful for getting the frame orientation just right. Note that the direction of scraping is TO THE LEFT in the picture, you are scraping AWAY from the cutting edge of the blade. Finished scraping frame and forks. Took about 8 hours over several days, pretty tedious but making progress. The SRAM Force compact 10 speed groupset got here this week, so I've almost got all the parts to put it back together. This is taking a lot longer than expected, because I'm still waiting for wet/dry sandpaper and the clear coat aerosol to arrive in the mail and everything is coming from outside the country. Canada Post is painfully slow. However I did buy some wheels so at this point I think the only thing I'm missing is new cables and bar tape. Slowly making progress. Spent about 5 hours wet sanding the carbon fibre and dropouts, and polished the alloy crown on the forks. Wet sanded the alloy crown up to 2000 grit but it was still dull, so I hit it with my Dremel and some polishing compound on a felt wheel and that gave it a really nice mirror finish. 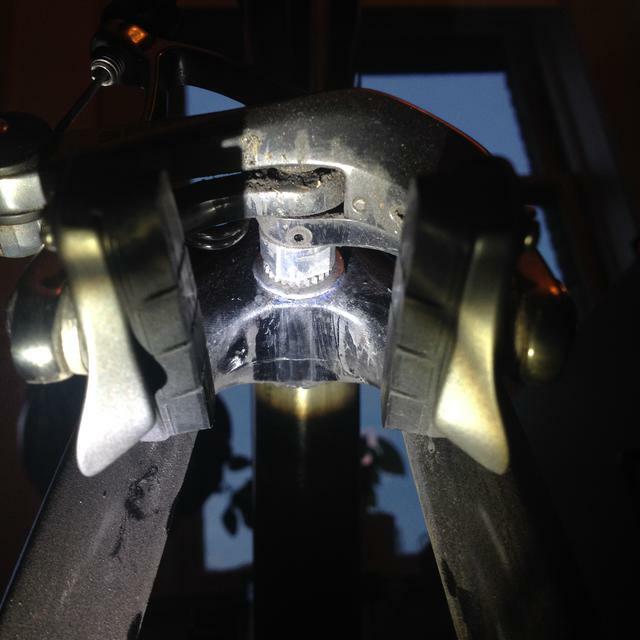 Knocked the finish off the dropouts with the Dremel and some sanding discs on an EZ mandrel. Painting the drop outs and cable stops by hand now. Had some vinyl pin striping tape left over from another project so I'm laying down a few black on carbon stripes on the top tube and seat tube. Almost ready for clear coat. Started the build yesterday. I need to find a longer mount bolt for the Sram Force rear brake that I got used, but other than that, everything is going on easy and it's starting to look like a bike again. 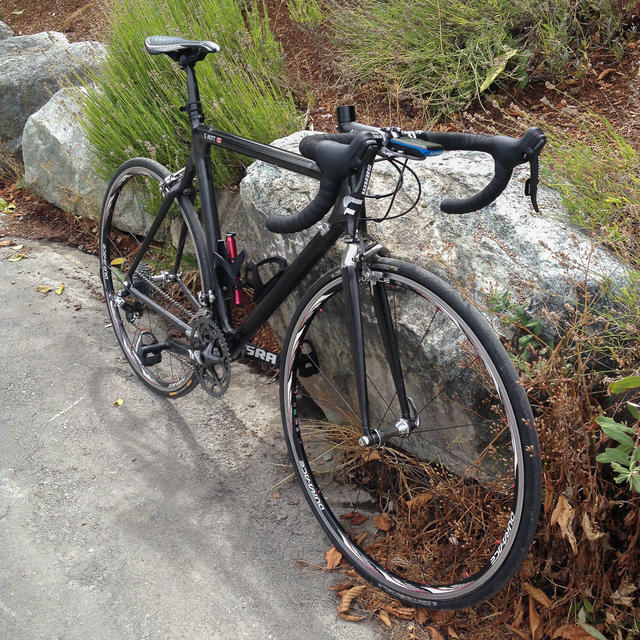 * Feels FAR more responsive compared to my old aluminum frame/carbon fork Trek 1200. At first the steering felt very twitchy but I quickly got used to it. Probably a result of fresh headset bearings and lower wheel weight, so less gyroscopic effect. The head tube angle is the same, and I swapped the same stem from my old bike. Accelerates and brakes quicker, rolls quicker, climbs faster, changes direction more easily. Nice. * Less road noise and vibration. Didn't think there would be that much difference, but there is. It's gotta be the frame, because I'm using the same width tires at the same pressure as my old bike. The new Dura Ace 7850 SL wheels might be helping, but they're still alloy, so not that different than my old R500s. * SRAM Force 10 speed is really crisp and accurate, although I haven't got the front derailleur dialed in yet. Taking some time to get used to the compact crank and the double-click to upshift. Compared to my old 9 speed triple, there's a massive difference between the chain rings and less difference between the gears on the back. Having to do a lot more front shifting. The Jagwire Pro cable kit was really nice to install and I expect it will work well for a long time. I'd never done a full cable install before. * Brake levers and calipers feel good, grippy but good modulation. Using some new Shimano 105 pads with them. Haven't done any massive downhills yet to really give it a stress test. A little squeaky, but they probably just need to bed in. 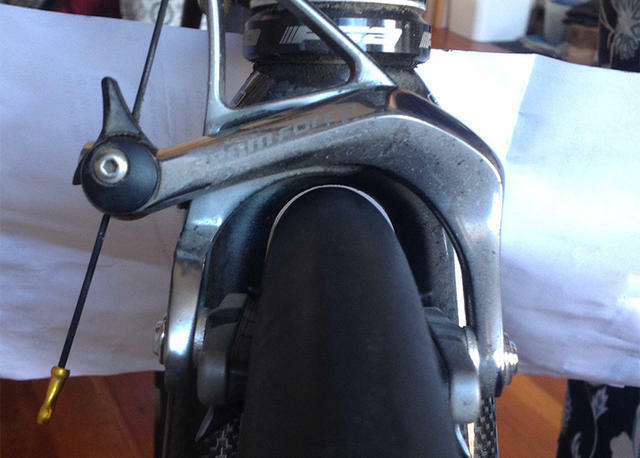 * Enjoying the compact 3T Ergosum bars, I had semi-compact bars before. I can spend even more time in the drops and actually spend extended time in the hooks now. More aero, more faster. Figured I'd get the alloy Ergosums to try out before sniffing around for Team or LTD bars. Routed both the brake and shifter cable together around the front, and it makes a very comfortable grip for climbing on the tops. Used Bontrager gel cork bar tape that I've used on my other bikes, very comfy. * Ritchey WCS Carbon Link post and Streem saddle combo working well, after I torqued the saddle bolts to the indicated 15 Nm (pretty damn tight). Was having problems with the seat slipping/tilting forward over big bumps, but the torque wrench and some grip paste has fixed that. 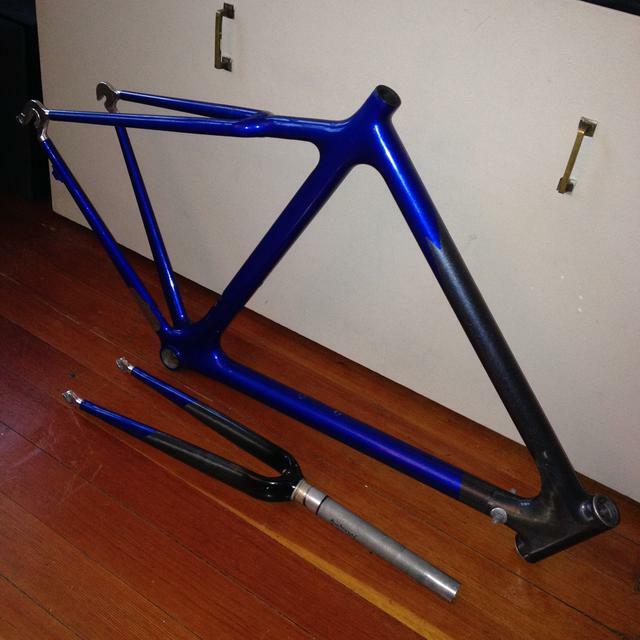 Could save some grams by cutting the seat post, it's ridiculously long for my frame with it's classic horizontal top tube. But I can't bring myself to hacksaw such a nice post. The saddle looks a little delicate on this big, round tubed frame - might look around for something that looks a bit more substantial to balance out the looks. Nit picking. 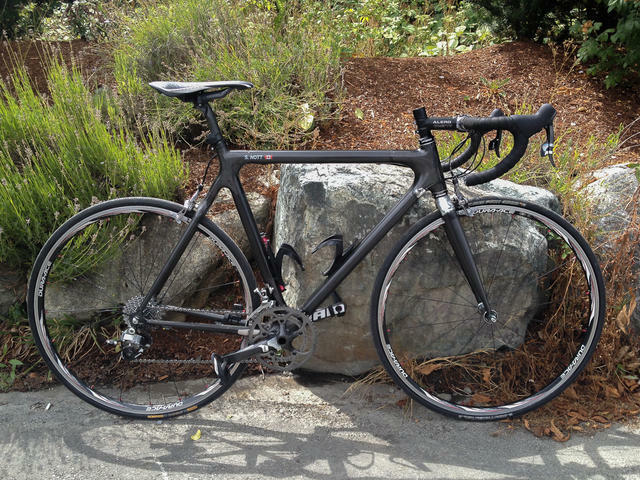 Could certainly get it under 6.8 kg with a SRAM Red upgrade, carbon bars and stem, full carbon fork, and lighter wheels but I was trying to stay within a budget. I'll keep my eye out for deals, but let's face reality, I weight 78 kg right now so what's a few hundred grams. Still a few things to do, such as trimming the cables, cutting the steering tube, and I want to try a 10mm shorter stem just to compare, the stack/reach geometry on this frame is a bit different and I'm getting tight shoulders after a couple hours. A bike is never really done is it? 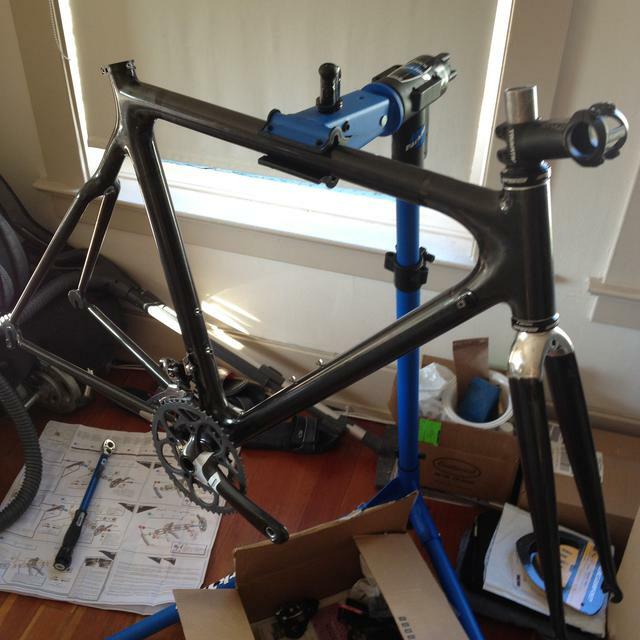 In total I probably spent around 20 hours working on the frame, and another 15 shopping for parts and building it up. Haven't added up the cost yet but I can if there's interest. Would I do it again? Probably not, although I learned so much that doing it again would definitely be easier and faster. On the other hand, I have a bike that I feel connected to because I've worked on every millimeter of the thing, and I chose every part on the bike. Every time I look at it I want to go for a long, hard ride - so I count the project as a success. The new post and saddle combo is about 60g heavier than the Ritchey WCS Carbon Link post and Streem saddle combo, the monorail mounting really does save quite a bit of weight. But it's nice to have a "traditional" rails setup, and I think the chunkier saddle matches the chunky carbon frame a lot better. Changed up the geometry a bit too, swapped out the Alero 110mm stem for a 100mm and tilted the bars down slightly - I feel a lot less stretched out on the hoods now, and can spend longer and longer in the drops (although I'm still working on my core strength for riding aero more). Tried raising the saddle a few mm but changed it back, I think I've got it set perfectly. New photos coming soon, just have to cut down the new fork tube. I finally ponied up for the Park Tool SG-6 Threadless Fork Saw Guide so I can make straight clean cuts through the steerer tubes, always a bit of a nerve wracking process. Good news, the Trek 5200 frame will (just barely) fit 28c tires. Last month I bought a barely used set of Pacenti SL23 wheels (24.5mm external rim width) and put on the Michelin Pro4 Endurance 28c tires I've been using on the CX bike all winter, which when mounted measured exactly 28mm wide. As you can see from the photos below, it's a tight fit, but I just gave it a road test and it works fine. 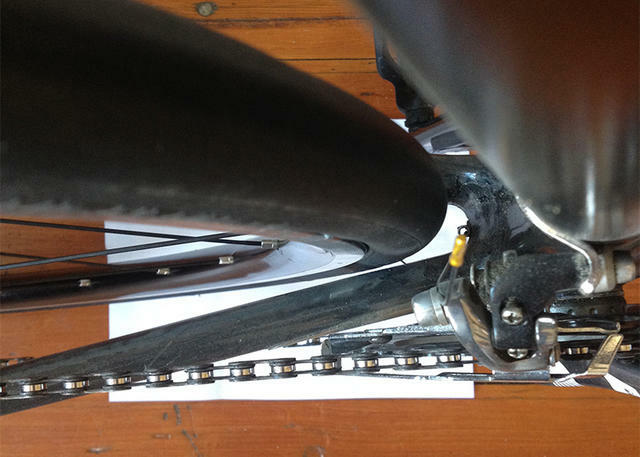 At the rear there's about 1.5mm clearance to the drive side chainstay, and about 2.5mm clearance on the non-drive side. In the front, I'm using an Alpha Q GS-10 fork, and there's about 1mm clearance at the top of the tire and around 2mm clearance on either side. If any debris stuck to the wheel and got jammed, it would be a bit of a disaster with such small clearances, probably shred the tire instantly. 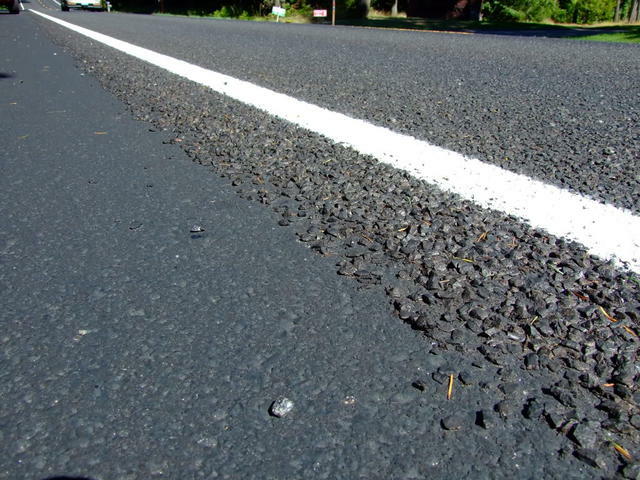 However, this bike is almost always used in dry weather, and a lot of the roads out of the city are that awful "chip seal" surface. These 28mm tires at 80/90psi front/rear are incredibly smooth and I think I'll be getting a lot of use out of them. Any questions, just post a reply below. Update June 2016 - I haven't ridden this bike in a few weeks, I took it down to go for a ride and noticed the back tire was rubbing on the seat stay bridge. I had to deflate the tire to around 50 psi to get any clearance, that's too low for me to avoid getting pinch flats, so I guess 28mm tires aren't going to work on this bike. Not sure why the tire changed shapes, perhaps it took a little while to adapt to being mounted on a wider rim? Shame, it was a nice ride. Looks like this frame can only handle 25mm tires max. Glad I noticed before I went for a ride, the carbon and clearcoat seem to be fine, just a little bit scratched.